Are you thinking about purchasing a horse? If this is your first time buying a horse, rushing into a sale can mean a costly mistake. Just like when buying a home, you need to make sure you have done your research and are confident you are making a sound investment. Would you buy a home without inspecting it first? No. Same with a horse. Unless you are highly experienced, you need to hire an agent (just as you would when buying a home) to guide you through the process. But what else is there to consider? What should you look out for? Cynthia Redwine Martinez, co-founder of Equine Exchange, has put together a checklist of all the “Must-Haves” when buying a horse. 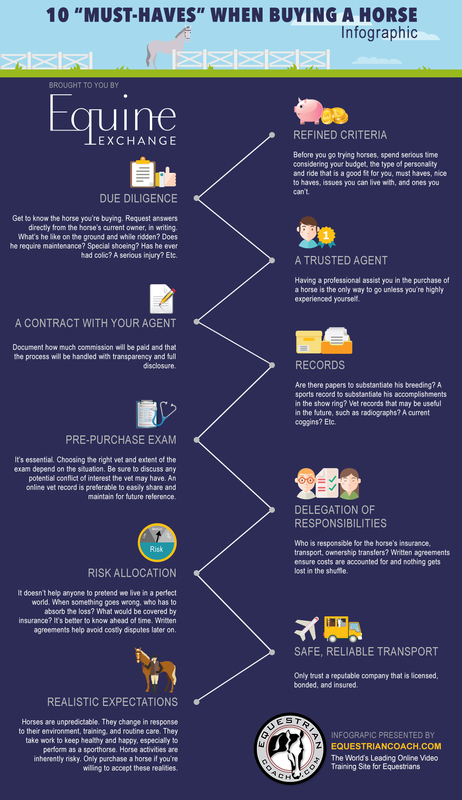 We have created an infographic for easy reference and to serve as a checklist for horse buyers. Equine Exchange is the first interactive online platform to facilitate horse transactions among buyers, sellers, trainers and veterinarians. 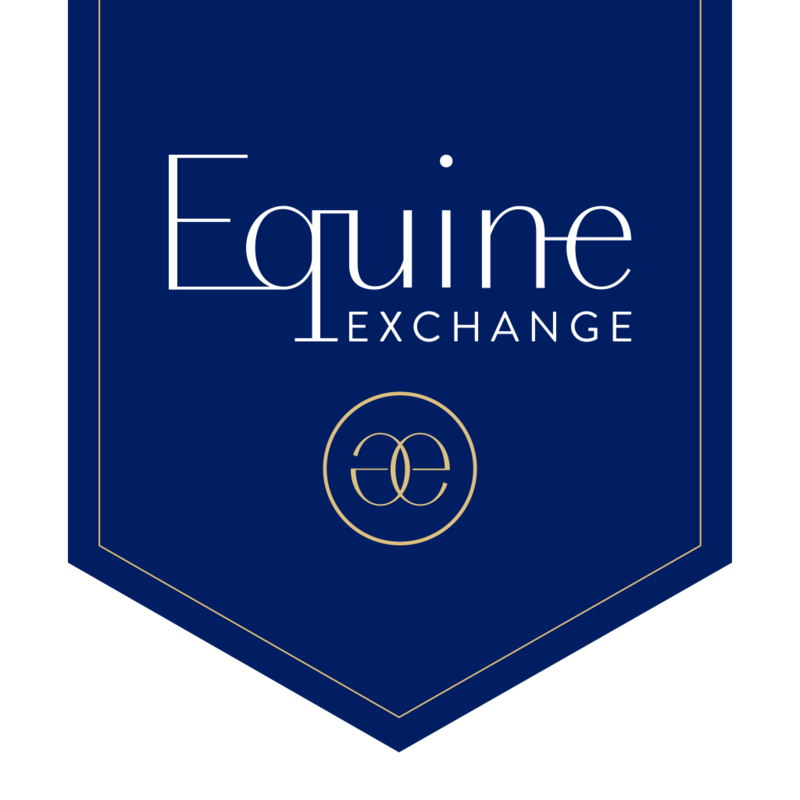 Equine Exchange is modernizing the way horses are bought and sold around the world, with transactions that are open and honest, standardized with a familiar process (similar to real estate), and lower risk for all parties. Buyers have increased confidence in their investment, sellers know who they’re dealing with and how their horse will be treated, and professionals are protected from financial and reputational risk. All parties benefit from setting clear expectations in writing, the efficiency of a mobile and paperless process, and doing business with professionalism and integrity. Receive 20% off your transaction with Equine Exchange by using the coupon code EQCOACH1 at checkout. Cynthia Redwine Martinez is a lifelong equestrian, business lawyer and co-founder of Equine Exchange. She breeds Holsteiner horses for show jumping and enjoys competing in the amateur jumper divisions. She has practiced business and transactional law for over a decade. She earned her law degree and MBA from the University of Texas and her undergraduate degree from Georgetown University. Impressive! Very well written article. 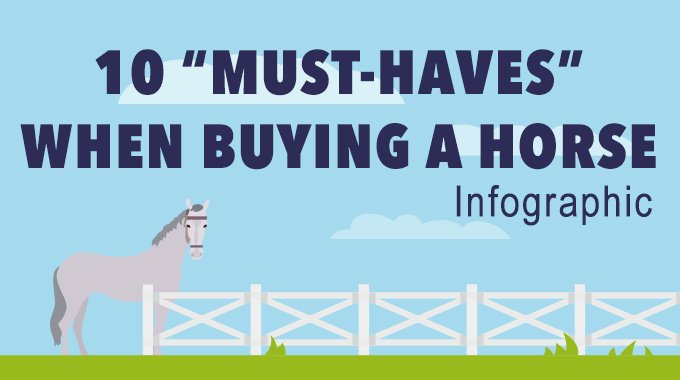 The infographic that you’ve provided is very helpful; after all, not everyone is going to know what to do when wanting to buy a horse. I think it is particularly great that you bring up the importance of a pre-purchase exam. After all, you will want to make sure that the horse is in good health before you spend a ton of money buying it.